Your vote has the power to make a difference for good -- for our families and our culture. THANK YOU for caring enough to do your part! As your statewide pro-family leader, SaveCalifornia.com is here to help you vote your values with confidence. On California's Election Day -- where available, neighborhood polls are open 7am to 8pm. November 6 is also the last day for you to vote by mail -- either postmark it by this date, or drop in a secure box at a neighborhood polling place by 8pm -- locations are printed on your sample ballot. SaveCalifornia.com provides the following solely for educational purposes. Since our beginnings in 1999, our pro-family, pro-child organization has taken positions on ballot measures, yet our nonprofit status does not permit us to support or oppose candidates for public office. 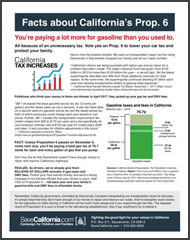 See, print, and distribute these 3 SaveCalifornia.com fact sheets and guides to friends and family, at churches, and at local organizations you're part of. Print size: 8.5 x 11 each. You can also share on social media. Note: Documentation for the Governor's Race Report Card (11 pages) can be viewed by clicking the blue link under the flyer. Click each flyer to view & print. SaveCalifornia.com is happy to provide you with our analysis of 11 California ballot propositions. Since 2000, our pro-family picks have been based on evidence, logic, and Jesus Christ’s command to “love your neighbor as yourself." Our overarching purpose is simply this -- to love people by communicating God's goodness and honoring His design for our lives, which has great benefit to individuals, families, and society as a whole. 1 NO A big-government "housing" bond (more costly than a direct tax, this would cost California taxpayers $5.9 BILLION) that would create a new dependent class with the State replacing the private sector in the development of new housing. 2 NO Another big-government "housing" bond costing taxpayers up to $5.6 BILLION, while doing zero to solve mental illness, yet rewarding transients. 3 NO This very expensive "water" bond would "soak" taxpayers for $17.3 BILLION at the behest of the inhuman environmental groups, without constructing any new water storage for Californians, who pay too much for too little water. 4 NO A $2.9 BILLION money-grab by hospitals (this the 3rd time since 2004 that the private sector has qualified a ballot measure demanding that you fund them). 5 YES Eliminates the so-called "moving tax" for homeowners 55 years and older who move to a new primary residence -- their property tax will not increase. 6 YES Repeals the unnecessary and burdensome gas tax and DMV fee hikes from 2017 (if Prop. 6 doesn't pass, next year you'll pay 76.7 cents total tax for each gallon of gas). 7 NO With Daylight Saving Time, Californians drive more safely, are outside more, and children on winter mornings don't have to walk to school in the dark; vote No on 7 to prohibit the State Legislature from eliminating this reality. 8 NO Caps prices at kidney dialysis clinics, likely causing clinic closures and sending needy patients to the ER, where taxpayers often foot the bill. 10 NO Caps rents at all rental housing, establishes up to 539 new government rental boards that can add fees on top of rents, demotivates landlords from renting residential properties, and will reduce the number of rentals and new rental properties in California. 11 YES Fixes a bad state law of the Democrat politicians on mandatory meal and rest breaks, instead allowing private emergency medical technicians and paramedics to respond to calls while on a break, just like firefighters and police. 12 NO This invasive measure by animal "rights" activists would financially harm California families by increasing everyone's costs for meat and eggs, and by creating an expansive new bureaucracy threatening ranchers in and out of state. SaveCalifornia.com knows that big government often robs people of personal responsibility and saddles working families, property owners, and small business owners with greater financial burdens. It's all because big government refuses to investigate and slash its own waste. Because of the influence of government unions and bureaucracy, independent, tough audits are simply not seen. Therefore, we encourage you to vote NO on ANY AND ALL tax increases, tax extensions, bonds (which is borrowing money, and always more expensive than a direct tax because you must also pay back interest), fees, and assessments. It's pro-family to keep more of your hard-earned money, so it's pro-family to oppose wasteful government taking away more money from you and other Californians. Sneaky politicians like to take it incrementally, so you must consistently oppose even the smallest tax/bond/fee/assessment increases in order to inhibit the government from making you and your family poorer. We're grateful that you're here digging into the issues and getting the facts. And we're so thankful for all of the people who make this California Pro-Family Election Center possible. People just like you, who care about moral values, religious freedom, the sanctity of life, financial freedom, and the future of our children. 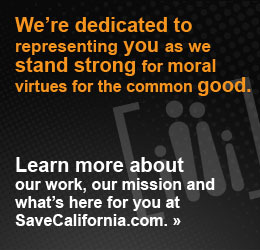 It's a privilege for SaveCalifornia.com to fight for you and your values -- not just at election time, but throughout the year. You're invited to receive "Insider Email News and Alerts" reporting issues impacting you and your family. Get your free California "Insider Email News." Don't trust the "Republican voter guide" or "Democrat voter guide" sent to you in the mail. WHY? Its "endorsements" are PAID by the candidates themselves! Look at the FINE PRINT. Don’t rely on voter guides in the mail unless they are from a trusted, recognizable source. And unfortunately, those trusted sources are very few and far between, because even some pro-family voter guides are including pro-perversity Republicans as "pro-family" candidates. You must do you own research to make informed decisions. 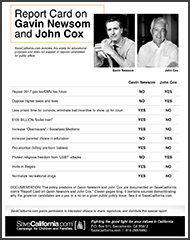 While SaveCalifornia.com does not support or oppose candidates, we provide links to voter guides that list candidates’ positions on issues and scorecards of elected representatives' votes. These links speak for themselves and do not represent the views or opinions of SaveCalifornia.com. Your best research on candidates will be done by yourself. Google a candidate's name along with one search term at a time, such as: abortion, gay, LGBT, gun, taxes, parents, family, religious freedom, etc. Then visit candidate's websites for their specific positions on family and moral issues. And consider emailing the candidate to ask specific questions. Your second-best research is the actual votes cast by incumbent politicians. » Equality California: "Our Endorsements"
In 2018 in the California State Legislature, a combination of 77 legislators in the Assembly and Senate voted in favor of AB 2943 to ban professional counseling for individuals who want to overcome homosexuality or transexuality, and which unconstitutionally threatened the free speech and religious freedom of churches. In 2018 in the California State Legislature, nearly all the Democrats, along with 12 Republicans, voted in favor of "in-service training" of K-12 schoolteachers to further brainwash schoolchildren with the unnatural, unhealthy, tyrannical "LGBT" agenda. On this issue, these Democrats and Republicans are to the left of Governor Jerry Brown, who vetoed AB 2153. » Life Priority: "Orange County Pro-Family Candidate List"
Carefully consider a few "pro-family" voter guides. But remember, if certain incumbents are portrayed as "pro-family" or recommend, check the filters above to see how they vote on the "LGBT" agenda. SaveCalifornia.com provides this voter information solely for educational purposes and does not support or oppose candidates for public office. These links speak for themselves and do not represent the views or opinions of SaveCalifornia.com. » "Robyn Nordell's Conservative California Election Website"
» "Orange County Pro-Family Candidate List"
There are strict constructionist judges and there are judicial activists. Do the judicial candidates on your ballot believe in upholding the written law (strict constructionists) or in "re-interpreting" the law to suit their personal agendas (judicial activists)? A big-government "housing" bond, placed on the ballot by state legislators, Prop. 1 would create a new dependent class and cost California taxpayers $5.9 BILLION (since you must pay back 35 years of interest along with the principal, a bond is always more expensive than a tax.) Prop. 1 is a liberal, utopian dream, which goes against human nature and against good government. Authored by Democrat state legislators, this ballot measure accomplishes the #1 foundational philosophy of the Democrat politicians -- to take money from the responsible to give to the irresponsible. By creating a raft of "State Housing Programs" -- such as "Affordable Multifamily House Programs," "Infrastructure Programs," "Homeownership Programs," "Farmworker Housing Program," "Veterans Housing Program" -- Prop. 1 puts government in charge of housing instead of freeing the private sector from the big-government shackles that have caused California's big housing problem, which has given us more Demand than Supply of housing. Ultimately, Prop. 1 will create more government dependents who will vote for bigger government that takes away money from one group of people to give to a more "needy" group. Communism founder Karl Marx and Communist dictator Joseph Stalin would be proud. This is another big-government "housing" bond that would do nothing to solve mental illness but would cost taxpayers up to $5.6 BILLION. The background of Prop. 2 is Proposition 63, a foolish idea approved by voters in 2004, which increased the income tax for individuals' income above $1 million – this was class warfare and was wrong -- and then directed those special taxes to "various county mental health services." Prop. 2, which was placed on the ballot by the California State Legislature, proposes to use some of that Prop. 63 money for housing for mentally ill transients. While some of SaveCalifornia.com’s friends are supporting Prop. 2 because they want construction jobs for building apartments for this measure’s eligible mentally ill transients. But that’s not the public message of Prop. 2, or its purpose, or how it’ll influence the new rewards of becoming a transient. 3) More Californians will vote for big, "nanny" government because the Democrats are purportedly “solving the homelessness problem” (because they stop the passage of good bills against the inner and outer problem of transients). 4) Lastly, mentally ill transients would not benefit long-term from Prop. 2. Yes, the average voter may see some former street transients go away, but panhandling is popular for drug money, and if there are “too many rules” at the state-provided apartment complex, some street transients may choose to stay on the streets for the relative “freedom” it offers. Does passing Prop. 2 harm a transient more than a defeat of Prop. 2? SaveCalifornia.com is concerned that it does. Because Creator God’s design of man doesn’t change, and getting something for nothing tends to promote more personal irresponsibility and more government dependency. Instead of Prop. 2 and government housing for mentally ill, how about getting to the real issue of a soul problem, where transient individuals are beset with "inner demons"? As mentioned, the State of California would do much better by giving grant money to churches to develop spiritual transformation programs for transients, and using some existing taxpayer money for a marriage and family stability public message campaign (since most mentally ill transients had terrible childhoods). This big-government "water" bond would "soak you" for $17.3 BILLION, but it absolutely will not supply you with any more water storage. Instead, the environmental groups will get this money to further their inhuman agenda that decreases drinking water, fuels wildfires, curtails housing, and teaches bad "science" to children. These environmental groups have been the recipients of nearly $60 BILLION in similar "water" bonds since 2000 when you combine principal and interest. And they won't stop soaking you until you say NO. This big-government bond is another money-grab by the University of California hospitals and other hospitals. Costing taxpayers $2.9 BILLION in principal and interest, Prop. 4 is the third time since 2004 that the private sector has placed a measure on the ballot demanding that you fund them. Stop and think about this. Not only is this "forced love" disturbing, it also violates the spirit of the California Constitution, Article 2, Section 12 which prohibits initiatives from naming or identifying "any private corporation to perform any function or to have any power or duty." Finally, if you want children to really get well, realize that the medical establishment that Prop. 4 would fund hasn't healed any chronic diseases. Because holistic health and real nutrition are a threat to Big Pharma. This good proposition will protect homeowners' money from a thieving government, and is likely to keep more families together in California. By eliminating the so-called "moving tax," Prop. 5 says if you're 55 years or older, if you sell your home in one part of California and buy a new primary residence in another part of California, your property tax is eligible to stay the same, and not increase. While Prop. 5 is incremental tax reform benefiting only "seniors and severely disabled," we believe its passage is a very good moral thing for individuals and families. And no, it doesn’t matter that big-government types, whether they be politicians or bureaucrats or government employees, complain about “losing tax revenue.” They have completely forgotten that your money is yours. Vote yes on Prop. 5 to help family unity and family finances, and also to remind our culture that lower taxes is a good and honest thing. The best and most important proposition on the ballot, Prop. 6 will repeal the gas tax and DMV fee hikes imposed last year by 80 Democrats and 1 Republican in the California Legislature and signed by Democrat Gov. Jerry Brown. California government, controlled by Democrats, has been misspending our transportation taxes for decades. It's simply false that they don't have enough of our money to fix and build more roads. And it's outright scare tactics for the opposition to claim driving in California will be less safe if you repeal the gas tax hike. The taxpayer revolt of Prop. 6 is such a threat to the self-serving establishment, they’ll say anything to try to defeat it. With unreasonably high gas prices, you can roll back the liberal politicians’ 2017 money grab that has made California’s gas prices the highest in the contiguous 48 states. And realize this -- if Prop. 6 doesn't pass, California motorists will be paying a total gas tax of 76.7 cents per gallon in July 2019. High gas taxes such as this make the middle class poorer, and big government is directly to blame. For the sake of family finances and financial freedom, vote yes on Prop. 6, to bring real financial relief to you, your family, and your business, and, most of all, to remind greedy politicians that your money is yours. Passage of Prop. 7 by the voters would give the California State Legislature the option of, by a two-thirds vote, to either keep the current mix of Standard Time half the year and Daylight Saving Time the other half (where sunrises and sunsets are one hour later), or change to year-round Standard Time (this would mean half of the year would have "darker" mornings, and during the long days of summer, sunset would arrive one hour earlier). Currently, California, like nearly every other state, is on Standard Time from early November through early March and then goes on Daylight Saving Time until shortly before the November election. Prop. 7 was placed on the ballot by a narrow two-thirds vote of the State Senate (26 to 7) and by an overwhelming vote in the State Assembly (68 to 6). 1) More confusion between contacts in other states and around the world could result from California or other states changing their time zone. Consider that right now, most Californians know that New York is 3 hours ahead, Chicago 2 hours ahead, and Denver 1 hour ahead. And folks across the country know the same. But that order, not unlikely freeway lanes, would become disjointed if states chose different time zones out of sync with each other. 2) Since the time zones were set up for us as a nation by Congress in 1918, it’s not only functional, but appropriate, for Congress to lead with a unified national expectation, one way or the other. As historians note, time zones were unnecessary "before the 19th century because of long travel times and the lack of long-distance communications" -- which is the exact opposite of today's instant, global communication systems and jets that daily fly passengers to major cities worldwide. Today’s generation is not only communicating and traveling more nationally, but globally. Therefore, a state having a distinctly different time zone than other nearby states would cause difficulty in scheduling and even in remembering online meetings. 3) Lastly, having more daylight on a March morning and a July evening is a good thing. With Daylight Saving Time from early March to early November, people drive more safely, are outside more, and children on March's cold winter mornings can walk to school in daylight rather than in darkness. Keeping or rejecting Daylight Saving Time is controversial, and well-intentioned people with good values can disagree on Prop. 7. However, since two-thirds of the California State Legislature has already put this anti-Daylight-Saving-Time proposition on the ballot, approving Prop. 7 probably means kissing Daylight Saving Time good-bye. For the above reasons, SaveCalifornia.com recommends voting no on 7 for the greater good. Government-run health care has been around for some years, but it hasn't been good. At its core, "socialized medicine" has the government making medical decisions, not you; and in countries that fully embrace it (like Canada), there are long waiting periods for basic care because the supply of medical treatment decreases. What's more, socialized medicine isn't financially viable because government has a big appetite for revenues. Prop. 8 is another stab at expanding socialized medicine in California, starting with kidney dialysis clinics. By requiring a cap on the price of kidney dialysis, the government will determine the price. Our concern is this kidney dialysis is a life-saving necessity for sick individuals whose kidneys have ceased to function. They need treatment to live, often while waiting for a kidney transplant. Kidney dialysis is provided by the private sector for cost, usually reimbursable by private insurance or by the state and federal governments. This professional, life-saving service is subject to the foundational market rule of Supply and Demand. And when something like Prop. 8 comes along to cap payments, there's a real chance that local kidney dialysis clinics could shut down or no longer provide service. Supply of this service is a priority, which is why SaveCalifornia.com opposes Prop. 8 for how it very likely would decrease kidney dialysis clinics, pushing needy patients into hospital emergency rooms, where California taxpayers often foot the bill. Best would be for the government to completely remove itself and let capitalism and the resulting competition (especially in a high-population state such as California) produce lower costs of service. The less government is involved with taxes and regulations, the more we would see kidney dialysis clinics with trained technicians in more communities. This is another ill-conceived housing proposition, where the government takes control of rents. This is called Socialism, where the government replaces the private sector -- in this case, the rental market. Prop. 10 comes at a time when California is reeling from sky-high housing costs, a problem created by the ruling Democrat politicians in Sacramento. They've increased the demand by providing every magnet conceivable to illegal aliens, and they've decreased the supply with high developer fees and permitting a stranglehold of lawsuits by environmental groups. How to lower rents and the costs of housing in California? Do the opposite of the ruling Democrats by creating greater supply and lower demand. Lower the demand for housing by helping the federal government expel illegal aliens from California; by increasing the supply of housing by lowering or eliminating oppressive fees that cities and counties force upon developers; and by preventing the anti-human "reviews" and lawsuits from environmental groups who worship trees and love insects, instead of worshipping Creator God and loving precious human beings made in His image. Realize that if Prop. 10 passes, there will be a lower supply of rentals in California. Prop. 10 makes a bad situation worse by providing current landlords with the incentive to get out of the rental business. Why? Because Prop. 10 would limit their profits, and create burdensome new regulations at the city and county levels. 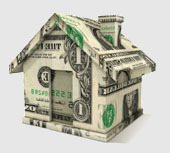 Indeed, in the face of these financial threats, owners of residential rental properties can instead sell their rental houses, townhomes, or duplexes to bonafide homeowners, and invest in Real Estate Investment Trusts (REITs), to earn dividends and produce growth, without landlord headaches or the new headaches of Prop. 10. This socialistic, government-control-type ballot measure is self-defeating in that it will mean fewer rentals. Simply put, Prop. 10 will cause many owners of rental property to stop offering rentals. Prop. 11 would correct a foolish Democrat-authored state law regarding mandatory meal breaks and rest breaks. This good proposition allows private ambulance workers to help people, instead of making them turn off their phones and radios and staying put during meal or rest breaks. In late 2016, the California Supreme Court upheld this foolish state law, a law lacking foresight and now threatening public safety. Fix this problem by voting yes on Prop. 11. What do you like better -- beef or pork? Since most people eat meat, and since chicken hen eggs are a staple in most people's diets, it should give you pause that animal "rights" activists (who hate the idea that Creator God gave man dominion over animals) have placed yet another proposition on the ballot that will make you pay more for beef, pork, and eggs. Prop. 12 proposes additional "minimum space" requirements for California ranchers of "calf raised for veal, breeding pig, or egg-laying hen." Because this requires bigger cages, pens, corrals, framing, and even more land, costs will go up and these higher prices will be passed on to you and your family. Even the biased analysis by the Legislative Analyst's Office admits, "Because this measure would increase costs for some California farmers who produce eggs, pork, and veal, some of them could choose to stop or reduce their production." You might be thinking, "Wait, didn't we vote on this before?" Yes, in 2008, when spacing requirements for pigs, calves, and hens passed and became state law. And these animal "rights" activists, who don't care about you paying higher prices, and who think you're terrible for eating meat, will keep coming back time and time again in pursuit of their utopian dream of giving animals “rights” equal to humans. Prop. 12 will also create bigger government and big fines for not fully complying with the new law. And every package of veal or pork, and every carton of eggs would be subject to the new Prop. 12 edict. As the Legislative Analyst writes, “The measure also makes it illegal for businesses in California to knowingly sell eggs (including liquid eggs) or uncooked pork or veal that came from animals housed in ways that do not meet the measure’s requirements. This sales ban applies to products from animals raised in California or out-of-state. The sales ban generally does not apply to foods that have eggs, pork, or veal as an ingredient or topping (such as cookie dough and pizza). Violation of the housing requirements or sales ban would be a misdemeanor, and a violation of the sales ban could also be subject to a fine in civil court. This measure also requires CDFA and the California Department of Public Health to write regulations to implement its requirements." While it's true that deeper yellow and orange yolks come from hens that scratch and peck on protein-rich insects instead of predominately eating processed corn and soy from a package, Prop. 12 isn't interested in good nutrition for human beings, but in elevating animals over human beings made in the image of God. If this passes, these ranchers will have to do a lot more and pay a lot more. Prop. 12 steals from private-sector ranchers, and makes beef, pork, and eggs more expensive for California families and for many families across the nation. While it's true that deeper yellow and orange yolks come from hens that scratch and peck on protein-rich insects instead of predominately eating corn and soy from a package, Prop. 12 isn't interested in good nutrition for human beings, but in elevating animals over human beings, people created in the image of God. If this passes, these ranchers will have to do a lot more and pay a lot more. Prop. 12 steals from private-sector ranchers, and makes beef, pork, and eggs more expensive for California families and for many families across the nation.